It’s a big deal to be charged with the task of managing a significant spend portfolio that covers the Asia-Pacific region. But this BP strategic sourcing manager takes it all in her stride. 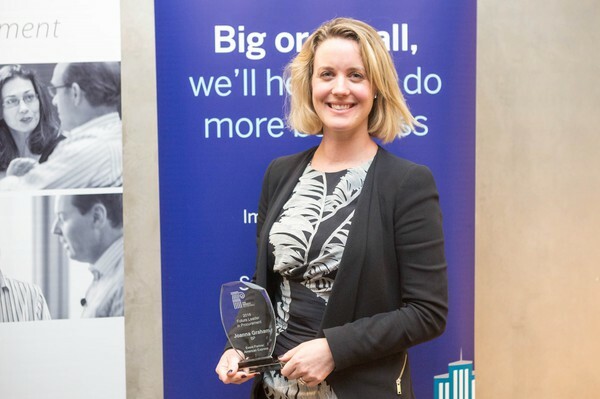 Meet Joanna Graham, winner of the 2016 Future Leader in Procurement Award. Graham looks after procurement for the retail networks of one of the world’s largest oil and gas companies. Her role encompasses the entire BP service experience, including building new service stations and travel centres, maintaining them and supplying them with equipment. She manages a team of four people. It’s no mean feat, particularly given that she’s played an integral role in a number of significant strategic projects recently undertaken by BP. “It’s a really exciting time to be working for BP, especially as there is a growing culture of innovation. There have been real opportunities to create value for the business as BP strengthens its competitiveness. This all creates an environment ripe with opportunity for Procurement to drive value in fresh and creative ways”. A glowing endorsement for Graham indeed, who spends a lot of her time on sourcing activities and negotiating complex contracts. Graham was also the procurement lead on a major process to select a joint venture partner and launch a new company to manage operations, engineering and maintenance of BP’s network of 18 fuel terminals dotted across the country. This piece of work subsequently extended to establishing a procurement function for the new company. Prior to BP, Graham worked in procurement roles for British multinational alcoholic beverages company Diageo, owner of brands Johnnie Walker, Smirnoff and Baileys, among many others. These roles took her around the world including to China, broadening her experience significantly as she perfected cross-cultural negotiation techniques. Graham says she learnt about cultural nuances and how they impact upon sourcing, as well as navigating supply chain complexities. “Living in China was an amazing experience both personally and professionally. I learnt so much in the time I was based there, and was lucky to work on some really exciting projects in a market that was at that time experiencing exponential growth”. After making three international moves in less than six years, relocating to Melbourne in early 2013 was a lifestyle decision. Graham continued to work for Diageo for a period, though the time difference made working with global colleagues in the UK and US difficult. “Since settling in Melbourne, I’ve been blown away by the strength of the Melbourne procurement community. They’re a very tight-knit community here, with networking events and Roundtable forums. Procurement professionals here are incredibly supportive, and willing to answer hot topic questions. Graham also praised the work done by The Faculty to build the procurement community in the Asia-Pacific region. Next on the agenda for Graham includes strengthening global team connections. Graham is advocating the use of social network tool Yammer as a valuable way to enable procurement team members from around the world to communicate quickly. The Future Leader of the Year award is sponsored by American Express. Previous PostHow Automation Could Shift the Negotiation LandscapeNext PostWorking from Home: Heaven or Hell?